Andrey Tarkovsky was the most important Russian filmmaker of the post-war era, and one of the world’s most renowned cinematic geniuses. He directed the first five of his seven films – Ivan’s Childhood, Andrei Rublev, Solaris, Mirror and Stalker – in the Soviet Union, but in 1982 defected to Italy, where he made Nostalgia. His final film, The Sacrifice, was produced in Sweden in 1985. Tarkovsky’s films are characterized by metaphysical themes, extended takes, an absence of conventional dramatical structure and plot, and a dream-like, visionary style of cinematography. They achieve a spiritual intensity and transcendent beauty that many consider to be without parallel. This book presents extended sequences of stills from each of the films alongside synopses and cast and crew listings. 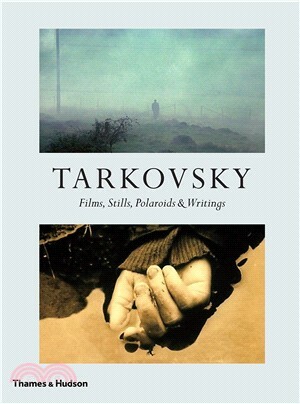 It includes reflections on Tarkovsky’s work from fellow artists and writers including Jean-Paul Sartre and Ingmar Bergman, for whom Tarkovsky was ‘the greatest, the one who invented a new language.’ Extracts from Tarkovsky’s own writings and diaries offer a wealth of insights into his poetic and philosophical views on cinematography, which he described as ‘sculpting in time’. The book also reproduces many personal Polaroid photographs that confirm the extraordinary poetic vision of a great artist who died aged only 54, but who remains a potent influence on artists and filmmakers today.